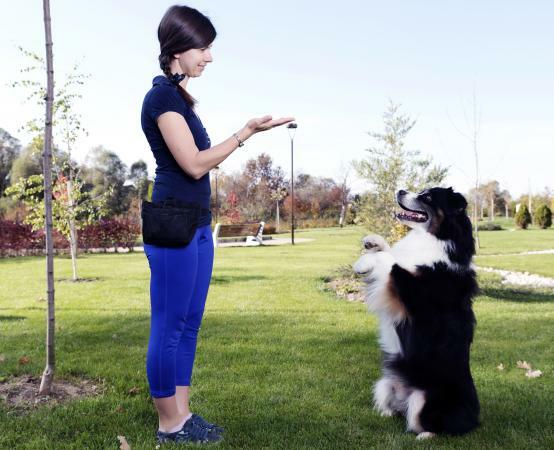 Are you considering a dog training career? You'll need a love of dogs, but there are many other skills needed as well. Carefully consider all the pros and cons of this career choice before you make a decision. There are two types of dog trainers. One type works with pet owners in what is usually called obedience school. The other type trains service dogs, which are canines that will work with people who are disabled or for the police. Even though both types of trainers work with dogs, the two tracks are very different careers. Many pet trainers are self-employed small business owners. In addition to training dogs, they also must attend to the details of running a business. This includes marketing their services and doing their own accounting. Some of this work can be subcontracted, but ultimately the success or failure of your business depends on your own hard work. Some enter this field with a love of dogs only to find that they don't like running a business. The other thing that disappoints some new trainers is working with pet owners. People have more varied personalities than the dogs they own. They will come to you with different opinions on what works and they may even question your training methods. As your business grows, you may find yourself working less with the dogs and more with the owners. It is possible to work for a larger pet training company. This type of company may contract with stores such as PetCo. Or, an independent trainer may need to hire additional trainers as his or her business grows. These options will shelter you from running a business but will give you less control over your dog training career. Training service dogs can be an attractive choice, because you get to work in-depth with the dogs and you are performing a valuable public service. There are no dog owners to deal with until the training is over. You also do not have to run your own business because most service dog training is done through non-profit organizations. There are many good aspects, but there are also some downsides to this career. You need to be physically fit to work with large dogs all day long. Pay is usually low because it is a non-profit service. Finally, getting into this field can be difficult because of limited openings and high demand for available positions. This is one field where many people are either self-taught or learn from an experienced dog trainer as an apprentice. You may be able to find some dog training schools, but they should be thoroughly reviewed before you sign up for classes. You should start by reading books on dog training. Working with your own dog is good practice. Volunteer to train other dogs as well. If you know of a professional dog trainer in your area, ask if you can work as an intern or an apprentice. It is also helpful to study marketing and other business topics if you plan to open your own obedience school. To get into service dog training, try and volunteer at a school to get your foot in the door. You may have to take a lower-level job to gain exposure. When an opening for a trainer becomes available, you'll have an edge over people who have never worked there. To find a service dog school near you, visit USA Service Dog Registration. Being a dog trainer is a good choice if you love dogs, are good at teaching and training and have a desire to be self-employed. There is no clear path into this field, but if you are a good trainer and are persistent, you'll eventually have a satisfying career working with dogs.